The 2019 Regional Job Fair is set to be the largest yet. 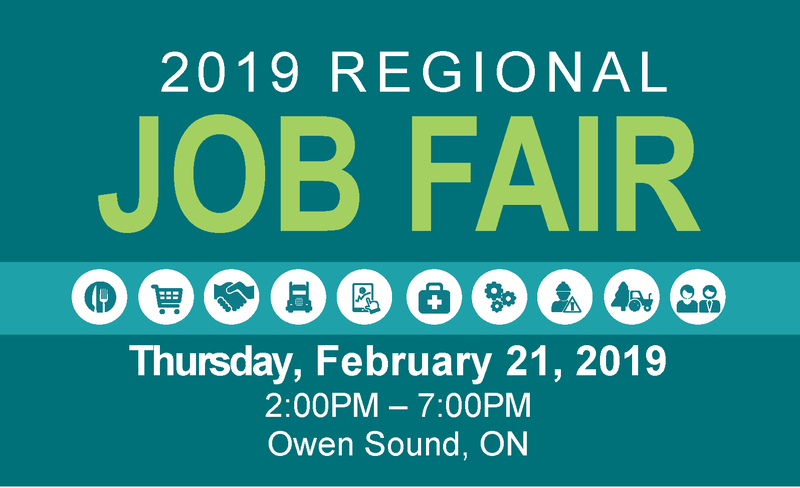 The area’s premier job fair returns the Bayshore Community Centre on Thursday, February 21 from 2:00 p.m. to 7:00 p.m. More than 100 businesses are already registered, offering jobs in manufacturing, healthcare, the nuclear industry, retail and more. Some registered employers include Chapman’s Ice Cream, Caframo Limited, Exceldor Foods Ltd, the Bluewater and Catholic District School Boards. A full list of registered businesses can be found at www.grey.ca/job-fair. Job seekers are encouraged to bring their resumes to the event. Some employers will be interviewing on the spot. Free transportation is available to help job seekers outside of Owen Sound get to the fair. Routes are organized from Hanover to Durham and down Highway 6, from Dundalk down Highway 10, and from the Town of The Blue Mountains down Highway 26. Space in vehicles is limited. All rides must be booked in advance by calling Mark Carlson at 519‑376‑7122 extension 1350 no later than 9:00 a.m. on Wednesday, February 20. Transportation will arrive around the time doors open at 2:00 p.m.
A group of skilled individuals from the GTA will also be attending the job fair as part of a full-day tour organized by Grey County and the Newcomer Centre of Peel. The purpose of the tour is to introduce newcomers to Grey County as a place to live, work and raise a family. The 2019 Regional Job Fair is a collaborative event supported by Grey County, the City of Owen Sound, the YMCA Owen Sound, Georgian College and the Four County Labour Market Planning Board. Stevcon Packaging & Logistics Ltd.
For media inquiries contact Rob Hatten, communications manager, at rob.hatten@grey.ca or call 519-372-0219 ext.1235, or 519-373-1592.